With SDS/2 version 7.3, tagging bolts, materials, and other items will be much easier with the addition of several tools to Drawing Editor. Label Combo combines the pointer, line, and label commands to quickly create any label attached to a pointer and line. The new Material Callout tool gives the capability to quickly tag any hole, bolt, or material polygons in Drawing Editor with needed information without actually typing a new label. The Label Combo tool works similarly to the Weld Combo tool, which has been a feature of SDS/2’s Drawing Editor for some time now. Label Combo can be used on any drawing type in Drawing Editor. To invoke Label Combo, select the Objects pull-down from the top of the screen, then choose Labels, and finally select Label Combo…. A toolbar button, quick key or right-click menu could also be set up to invoke this command. A single pointer or multiple pointers with an optional line can be created and users are allowed to type whatever label is required. If a label is not required, simply return out of the command before adding a label to create a pointer or pointer and line only. SDS/2’s new Material Callout tool can be used to tag any system-generated hole, bolt, or material polygons quickly with needed information such as material types, sizes, and piecemarks. Material Callout can be used on Detail, Erection View, or Submaterial drawings.To invoke Material Callout, select the Objects pull down from the top of the screen, then choose Material Callout, and finally select Add. A toolbar button, quick key or right-click menu could also be set up to invoke this command. Once this has been invoked, SDS/2 will prompt the user to select system-generated materials, bolts, or holes. Once one of these items is selected by the user, a label with previously mentioned information will attach itself to the mouse and the user simply needs to add the pointer(s) and optional line, then middle click to add the label of information attached to the mouse. A label edit window will open to allow users to customize the information in the label, or click OK to accept what SDS/2 created. 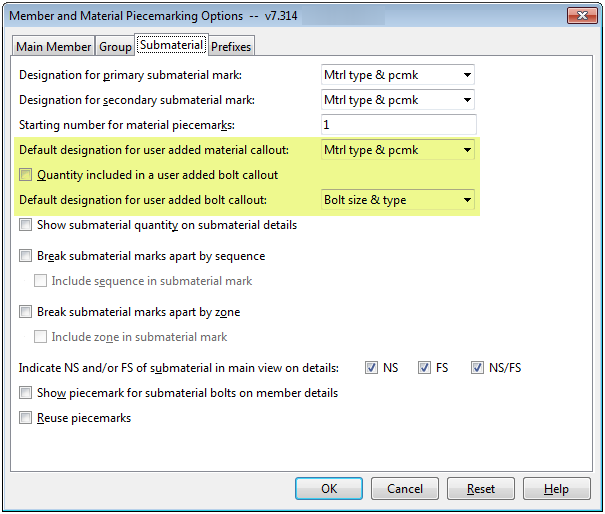 The information that is populated by SDS/2 can be determined by the user via setup options found in Member and Material Piecemarking Options. After this has been added, the label acts the same as any other label added to a drawing. For a more in depth look at how the Label Combo and Material Callout tools work, click here to watch a video on our YouTube channel. For further questions, please contact your SDS/2 support representative.